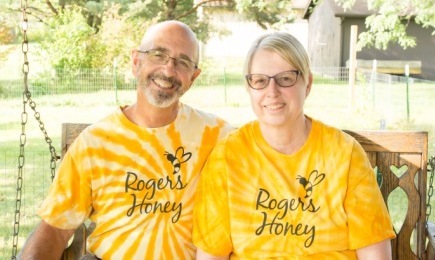 Roger's Honey is locally owned and operated by beekeepers Roger and Marlene Miller. They reside in Baltimore, Ohio. They extract and bottle the honey, make the jams, make the candles, skin cream and soap and sometimes hold classes to help new beekeepers. Roger started out with a few hives just as a hobby in 1980 and has continued to grow every year since. He is now retired and enjoys beekeeping full time. He has hives spread throughout central Ohio and Roger's Honey can even be found at some local stores and markets. Marlene joined him in 1999 and has learned quite a bit about beekeeping. She makes all of the jams including flavors like Blueberry, Strawberry and Mixed Berry. She also puts together all of the gifts mugs and baskets and makes the skin creams and soaps. Together, Marlene and Roger, have grown the business to what it is today. Some of the children are even involved in Roger's Honey. They can be found helping out at events (farmer's markets, craft shows, etc.) where Roger's Honey is set up for sale, helping to pour candles or even bottling the honey. Once you have tasted the honey or tried the skin care products, you will definitely be hooked.